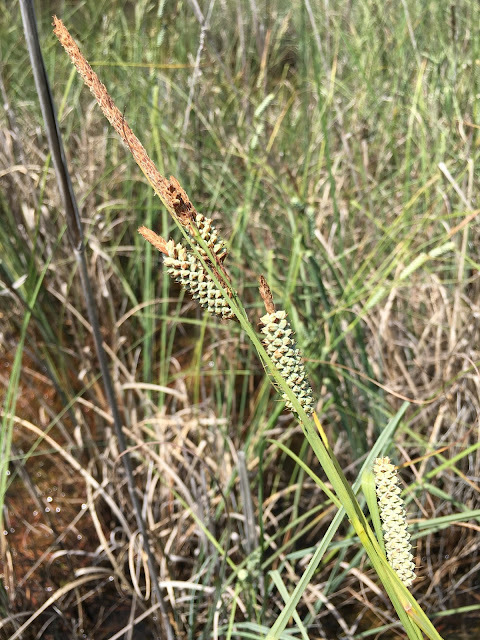 Don't be turned off by the ugly name, Warty Sedge (Carex verrucosa) is a chunky sedge that defies the stereotypes that sedges are all small, green, boring, and indistinguishable. It has seriously spiky inflorescences and seedheads that are striking in the field. It doesn't have any other common names that I'm aware of, so that makes things easy. C. glaucescens was described in 1817 by botanist Gotthilf Muhlenberg, for whom the genus Muhlenbergia is named (the very common landscape grass Hairawn Muhly, M. capillaris, is a member of that genus)2,3. It is vouchered for 45 out of the 67 counties in Florida. It can be found throughout Florida, from the Green Swamp (map) to the Chuluota Wilderness Area (map) and scattered throughout the panhandle3. It's also a fairly impressive full-sized plant, as you can see.